Russian Foreign Minister noted that further reductions of and restrictions on nuclear arsenals can be carried out on condition of equitable and indivisible security for all countries. The minister said that within the framework of the implementation of the so-called Presidential Initiatives of 1991-1992 Russia has by three-thirds cut its non-strategic nuclear weapons arsenal, transferred such weapons "to the category of non-deployed and placed them in central storages within the boundaries of the national territory." "This is an unprecedented step taken despite the fact that US nuclear weapons’ capable of reaching Russia’s territory are still operationally deployed in Europe," Lavrov said. Mobile Agni: Game changer or risky gambit? "Moreover, these American weapons are being modernized, and some European non-nuclear NATO members are actively involved in the so-called joint nuclear missions," the foreign minister said. "These joint drills of using nuclear weapons with the participation of non-nuclear NATO countries, confirmed by decisions of last year’s NATO summit in Wales, are conducted in violation of the first two fundamental articles of the Treaty on the Non-Proliferation of Nuclear Weapons." Lavrov commented on the development of the US anti-ballistic missile system. "Today, the strategic parity is affected by many factors," the minister said. "Those are the unilateral activities of the United States and their allies in organisation of the global ABM, which have already affected destructively the strategic stability, realistically undermining progress towards the so-called Nuclear Zero - the objective, which, I believe, many participants are sharing." The diplomat noted that further reductions of and restrictions on nuclear arsenals can be carried out on condition of equitable and indivisible security for all countries. "It is obvious that any further reductions of and restrictions on nuclear arsenals can be carried out only on the condition of ensuring equitable and indivisible security for all states," he said. "This is precisely the approach to nuclear disarmament that is enshrined in the consensus action plan for the 2010 Non-Proliferation Treaty. He also stressed that the potential of the Disarmament Conference hasn't been exhausted, and its functions should be restored fully. "The Disarmament Conference, which has offered several basic international agreements in control over armaments and non-proliferation, has a special role," he said. "The potential of this negotiations body is not exhausted." 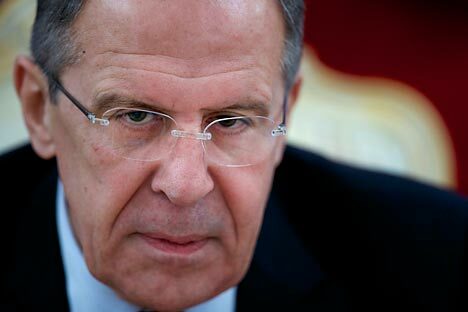 "We share concerns about "lack of movement" the Conference demonstrates now, and urge for restoring is functions fully by adopting an acceptable programme for its work," Lavrov said. "For that, we all should demonstrate flexibility, should find balance of interests, surely, without damaging the Conference’s basic principles." Lavrov stressed that Moscow insists that all the nuclear states should ratify the Comprehensive Nuclear-Test-Ban Treaty (CTBT). "One cannot ignore the fact that today many types of precision weapons in their capacities have already approached towards the weapons of mass destruction," Lavrov said. "In case of a abandoning or a sharp reduction of nuclear potentials, the leading countries in creating and manufacturing precision systems will gain a clear military advantage that could result in the ruining of parity and destabilisation," he said. Russia is seriously concerned that entry into force of the Comprehensive Nuclear-Test-Ban Treaty is delayed indefinitely, Lavrov said. "Unilateral moratoriums are important, but they are not equivalent to treaty obligations," Lavrov said. "The CTBT should be ratified by all the nuclear states without exceptions," he said, reminding that Russia ratified the treaty back in 2000. The Comprehensive Nuclear-Test-Ban Treaty has been signed by 183 countries but ratified only by 163 states. The states that need to take further action for the treaty to enter into force are the United States, China, Egypt, India, Iran, Israel, North Korea and Pakistan. The diplomeat noted the importance of launching negotiations on creation of a nuclear weapon free zone in the Middle East (MENWFZ). "There is serious concern about uncertainty on holding a conference on creating a zone free of nuclear and other weapons of mass destruction and delivery of such weapons in the Middle East," Lavrov said. "It seemed like efforts made by many countries, including Russia, gave hope for finding a comprehensive ‘package’ of the agenda and format of such forum," the minister added. However, "the conference failed to gather in the set timeframe," he noted. "Nevertheless, the issue of launching negotiations on creating MENWFZ remains a priority on the international agenda, and we think it is important to continue dialogue with the participation of all countries in the region in the interests of holding the conference as soon as possible," the minister said. "Russia is also ready to sign a protocol to the Bangkok treaty on the Nuclear-Weapon-Free-Zone in Southeast Asia," he said.